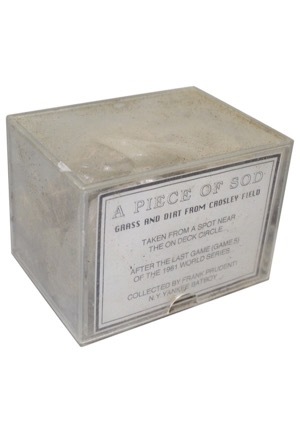 An excellent combo of rosin bag and sod swatch from Game 5 of the 1961 World Series featuring the New York Yankees and Cincinnati Reds. 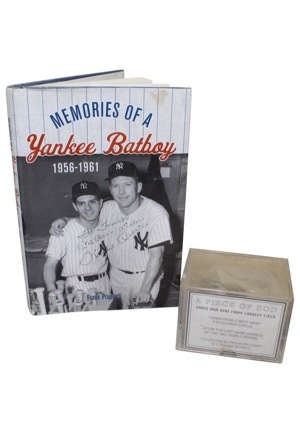 The Yanks beat the Reds in Game 5 at Crosley Field to capture the World Series 4-1, though the year is perhaps best remembered for Roger Maris breaking Babe Ruth's single-season home run record. The bag and swatch were collected by former Yankee bat boy Frank Prudenti, and they come with an LOA from Frank detailing the events. The rosin bag has a few holes in it, and both have labels from Frank's personal collection.